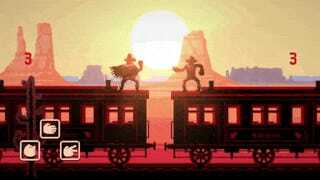 I never knew I wanted a Western-themed rhythm game with rock paper scissors until just now. Sifting through game jam entries can be thrilling and boring, a chance to explore an endless sea of creativity and an opportunity to drown in games with interesting ideas but poor execution. Now, however, the games have been voted on, and it’s possible to only play through the very best of Ludum Dare 32. My big recommendation? The Rock, The Paper, and The Scissors. The concept is absurd, seemingly obvious, and surprisingly satisfying. 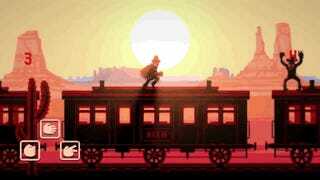 Set on the top of a train, you must make your way to the front of the car not by firing gun shots, but defeating an increasingly difficult set of enemies with carefully timed attempts at rock paper scissors. If you are somehow not familiar with rock paper scissors, it’s simple. You have three options—rock, paper, scissors—and each is defeated by another option. Rock beats scissors, paper beats rock, scissors beats paper. The game typically plays out by trying to guess what the other person might play, but in The Rock, The Paper, and The Scissors, it’s both rhythm and memorization. It’s tough to convey how music’s integrated in this post, but in essence, you want to time your (hopefully correct) responses in rhythm with the music. The more in time you are, the more attacks you’ll get in before the pattern resets. This is important, as some enemies can regain health. I’d actually say my attacks out loud to make sure I ended up hitting the right ones. The Rock, The Paper, and The Scissors won’t last you more than a few minutes, but it leaves an impression. In fact, the response has been big enough that the developers are fleshing the game jam prototype into something more elaborate, a game a called Rhythm Ranger. I can’t wait.